Posted by Phil Groom in Christian Book Trade. An online petition is hoping to save a store in Edinburgh, and in South Woodford, London, pledges of £31,000 have already been received to keep the shop open. The manager of Wesley Owen in South Woodford, Dominic Stinchcombe, is in no doubt that even if his supporters can find the other £30,000, the trade as a whole faces a bleak future without radical action. Stinchcombe’s campaign has been lifted by direct support from the pulpit of local churches. The Rev Steve Clark, vicar of St Andrew’s with All Saints, issued a rallying cry during his Sunday sermon for people to support the “ministry” of the South Woodford shop near by. 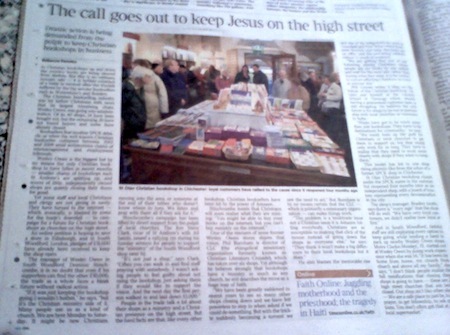 People in the trade talk a lot about their shops as a ministry and a Christian presence on the high street. But the hard facts are that, like every other bookshop, Christian booksellers have been hit by the power of Amazon. What we can find on the internet, of course, is an ability to campaign, connect and co-operate via blogs, facebook and twitter: Amazon might have cornered the online marketplace, but they haven’t captured the human spirit; and it’s that spirit — together with God’s Spirit — that drives us on. You’ll find the petition to save the Edinburgh branch here: Save Wesley Owen Edinburgh; go on, sign it; and keep an eye on their facebook page for latest news. More reflections on the trade’s future over on t’other blog: A Future and a Hope for the UK’s Christian Bookshops and The Future Shape of Christian Bookselling. If you’re in the UK and you run a church bookstall or are in church leadership, you can sign up for a year’s free postal subscription; anyone can sign up to the digital edition free of charge. So what are you waiting for? Get over there and sign up today! Christian Marketplace - Subscribe Today! 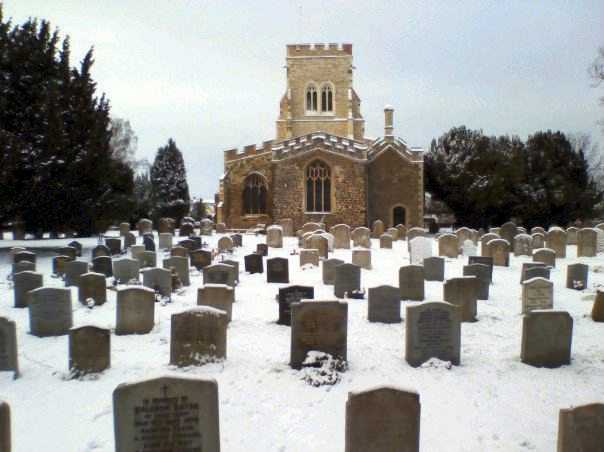 Posted by Phil Groom in Advent and Christmas, Short Story. I wrote this story a few years ago, and it’s appeared in a couple of church magazines since. I think there’s still a bit a mileage left in it so I offer it afresh to you, my friends here in the blogosphere. It occurred to me that the word epiphany sounds rather like the noise I guess a camel makes when it spits. Maybe that’s where the word comes from? Or maybe you know better? We were Tired. And when I spell a word with a capital letter, I mean it: this was a T bigger than Nero’s Nose. Okay, okay, so Nero wasn’t around then – but you’ve got to realise that we camels don’t necessarily look at things the way you humans do. Future? Past? It’s all the same to us – we remember both ways, and a lot of your lives have been saved because of that, because we know where the next oasis is as well as where the last one was. In the desert, it’s a question of survival – and we survive. But as I said, we were Tired. Almost as tired as God was when He invented the Sabbath. And now we were running scared, tripping over ourselves, nearly breaking our legs on the rough ground in the dark. I don’t know what scared my master most, the angel that warned us, or the warning he brought. But that mad king – Herod “the Great”, he styled himself – was after our blood. Because of the Child. We’d been on the road for two years. It would have been a much shorter journey if our masters had let us find the way, but they were Magi – Magicians, or Astrologers as you’d call them. So-called ‘Wise Men’ without the wisdom to know that camels don’t make mistakes. My master had cursed me for most of the journey because I’d kept pulling in different directions. Phtui! In the end I just spat in disgust and let him have his way. He’d regret it later. And now, as we ran, he did. Sometimes I almost feel sorry for you humans – until I think of the Child. But you still haven’t understood, have you? So after travelling more than twice the distance we needed to, we’d arrived. At the wrong place: Jerusalem. I spat angrily and snapped at the stable hand who came out to meet us. And after meeting with His Royal Bloodthirstiness, our masters had been redirected to Bethlehem – we were on the right road at last. The star reappeared, right on cue, above the house. His mother brought Him out to see us and, ignoring my master completely, He looked me in the eye and winked. Only two years old, but He Knew. I knelt in front of Him and for the first time in my life, I swallowed my spit. And for the first time my master didn’t shout a warning about me – he was too busy kneeling himself. It was going to take a long, long time and an awful lot of pain, but Things were going to Change. And I’m not talking about me stopping spitting.